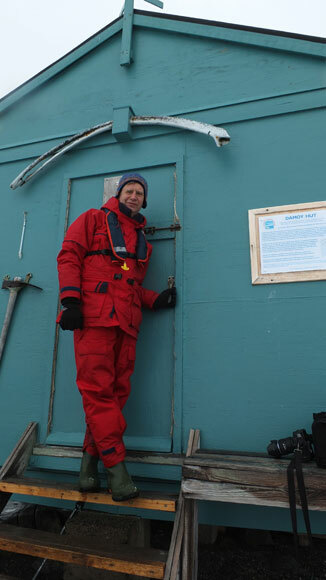 On January 21st, 2013, I returned to Damoy hut, on Doumer Island, having left on January 2nd, 1988. I first arrived there on December 5th, 1987, with about 20 British Antarctic Survey colleagues, expecting to be there a few days, before being flown further south to Rothera. 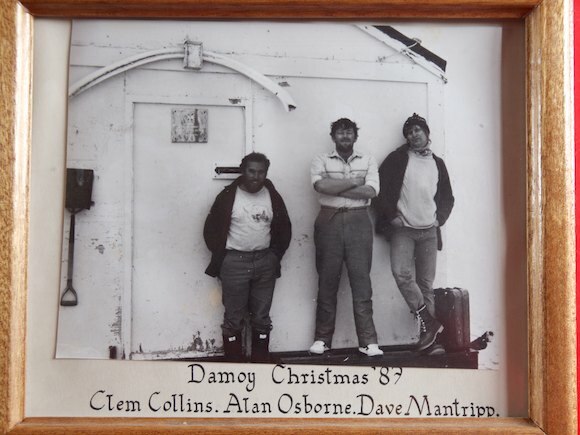 As it turned out, things didn’t work out quite as planned, resulting in myself, Clem Collins and Alan Osbourne not only being the 2nd ever party to spend Christmas at Damoy, but smashing all records by being the first to spend New Year there. So it figures quite strongly in my memories of Antarctica. 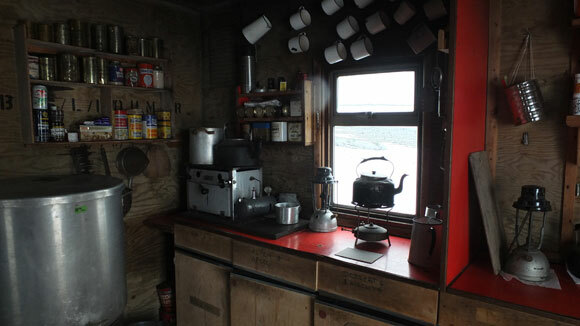 So, a few weeks ago, thanks to Graham Charles, the OneOcean expedition leader on the Akademik Vavilov, I was dropped off, together with Luchiana, at Damoy point, and we trekked up and over the point to the hut, about 1km away. 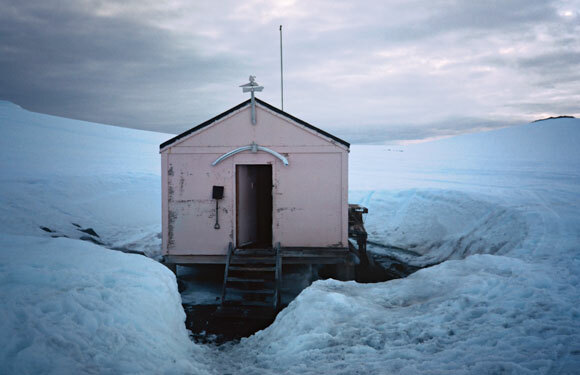 As far as I remember there was considerably more snow back in 1988… The hut itself has for some reason been repainted a sort of turquoise colour, rather than the pink hue it used to have. And the penguin weather vane has gone. Inside the hut very little had changed. On opening the door it felt just like I’d never been away. Apart from a few notices on the wall placed by the British Antarctic Heritage Trust, pretty much everything was exactly as it was. Even the smell was the same. 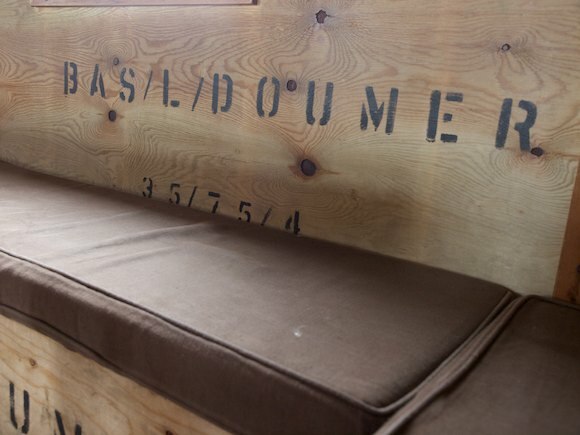 Inside the bunk room, the only thing missing apart from my sleeping bag was the radio. 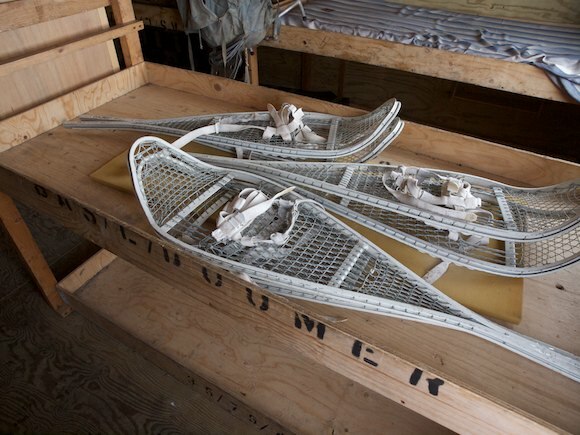 Three pairs of the original snowshoes, without which it was very difficult to get around outside, are still there. Actually it was only marginally easier getting around with them on: snowshoe design has improved somewhat over the years. One thing had changed, which I knew about, but had forgotten - the group photo we took on Christmas Day 1987 was on the wall. Digging out my notes on my enforced holiday at Damoy confirms that although it is a beautiful spot, I was increasingly frustrated, and bored, by being stuck there. 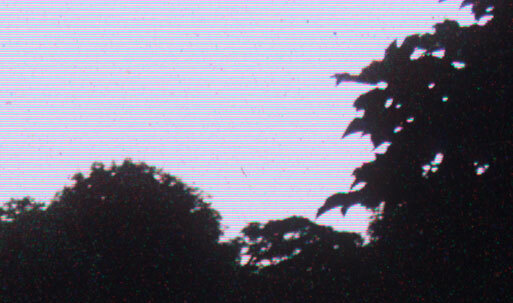 It would probably be something like paradise now, with a generator and a digital camera, but back then I wasn’t really that in to photography, and I was supposed to be a further 15 degrees south. 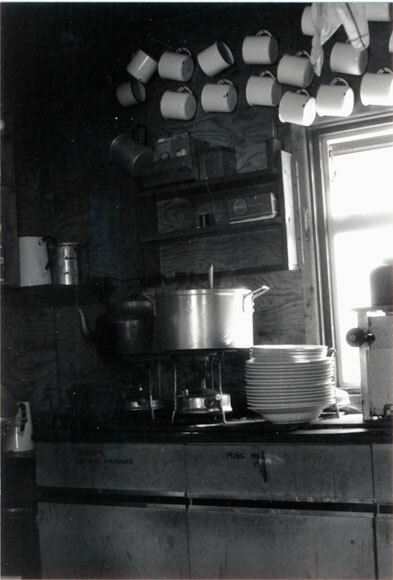 And we were running very low on paraffin, meaning that in the last couple of weeks we could not use the heater. And Alan, Clem and myself were not the most compatible trio you could pick. The weather was usually foul, and when it wasn’t, it was either foul at Rothera, or the aircraft were busy somewhere else. With the skiway snow warming up and deteriorating, It looked increasingly like we were going to have to be evacuated by ship. 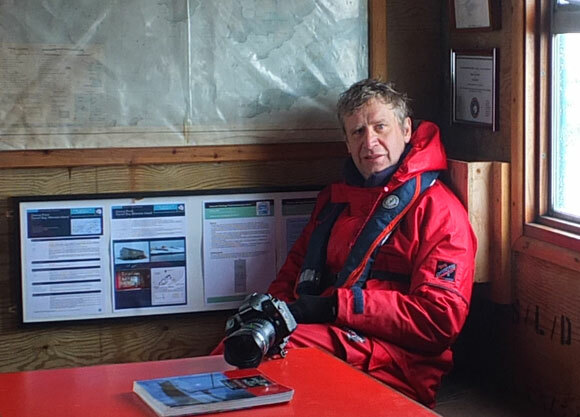 Finally, we were rescued by a Twin Otter piloted by my field party pilot Mike Collins, with the new BAS director David Drewery along for the ride (everybody at Rothera disliked Drewery, and gave him the cold shoulder. I felt sorry for him, and tried to get him involved in planning my field work, as it was in an area he’d been involved in. This did not prevent him stabbing me in the back a short while later, thereby demonstrating what a good judge of character I am). 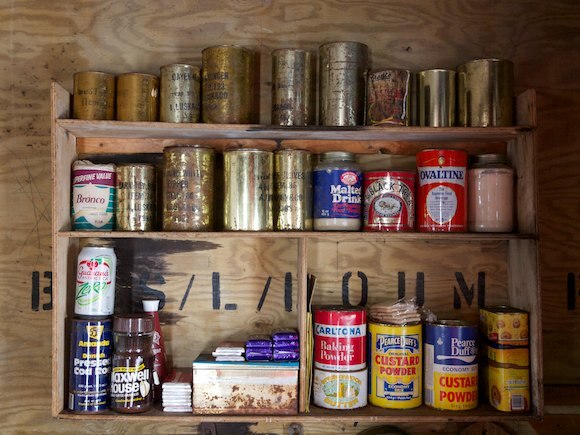 Back to the present day, it is remarkable how well preserved the hut is. Even to the extent of tins of the despised “Nespray” still being on the shelf. Actually there’s probably a hidden dump of Nespray tins outside somewhere. 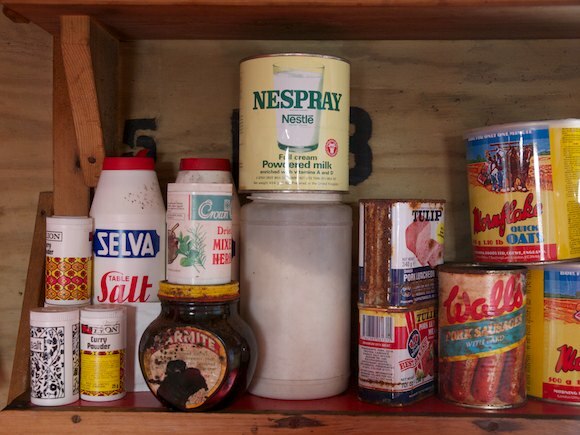 The various “Use Before Feb 1968” ingredients we used to cobble together some form of Christmas baking are still around too. I didn’t want to make Sophie, our zodiac driver, wait too long, and conscious of the fact that we’d been out of sight of any of the expedition staff for over an hour, I felt it was time to close and bolt the door one last time, and make our way back to the Point. On the way I couldn’t but help stopping a few times at the various Gentoo rookeries on the way. But none of the penguins seemed to remember me. 23rd December, Damoy: Well, we’re _still_ here, but at least today was exciting! The tourist ship “World Discoverer” passed through Neumayer Channel, answered our call and invited us on board for an evening barbecue! As they had anchored in Port Lockroy, they kindly sent a zodiac around for us. We were well looked after by both the crew and the passengers, the passengers being mostly Americans. 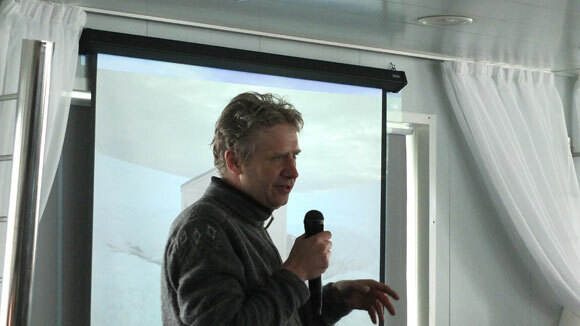 Before I got totally inebriated I gave the assembled masses a talk on BAS activities, using a familiar AKG microphone. Biggest audience and best applause I’ve ever got though! Anyway, we then passed on to the food, which was exquisite after 3 weeks of munch, and the mulled wine. This was probably my biggest mistake, but when you’ve been doing sod-all in the middle of nowhere for 3 weeks, you don’t pass up the offer of refill after refill from a rather nice young German girl. 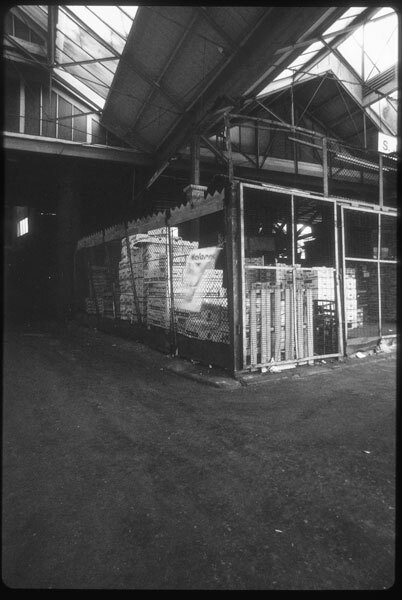 (…) We finally returned to Damoy with crates of Guinness, Budweiser and Carlsberg, 2 bottles of Port and a bottle of Bacardi, not to mention steaks and fresh vegetables. Later in the evening I felt rather unwell. 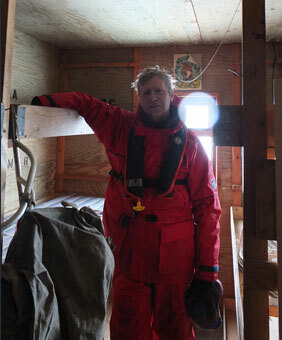 On returning to the Akademik Vavilvov, after, finally, after all these years actually making it to Port Lockroy, the when turned full circle as Graham invited me up during the recap to give a brief account of the day’s adventures. Little did I imagine this scenario just over 25 years ago. And finally the truly awesome Polagraph. 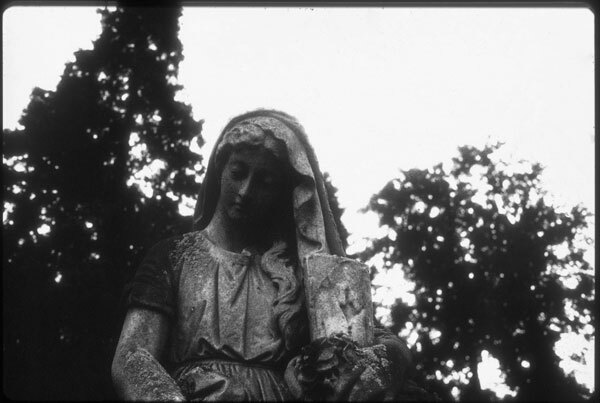 This film was intended principally for document reproduction (like, I believe, Kodak Technical Pan), but it was a match made in heaven for graveyards, crumbling ruins, etc. Admittedly it is somewhat limited in application, but, oh to have used it in Venice. Anyway, I’m in a bit of a hurry today, so I’ll let the pictures Speake Their Dismal Wordes. 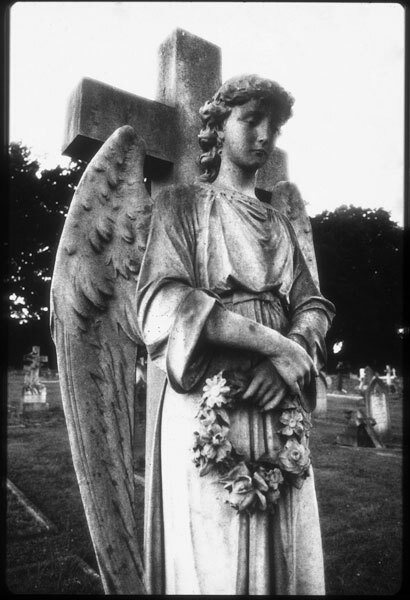 Both photos taken quite some time ago at the Mount Cemetery, Guildford, England. 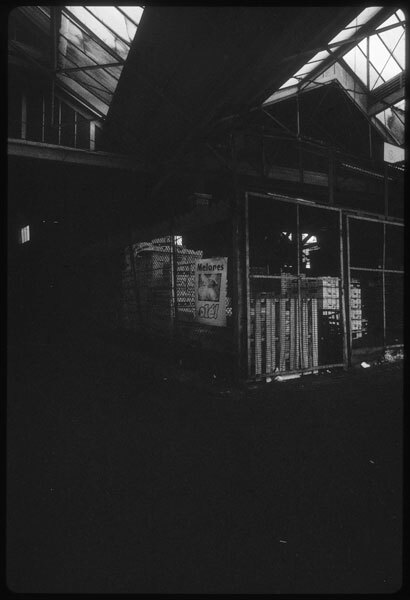 I couldn’t really get anything sensible from the film scanner, but the Canoscan 9000F managed a little better, being unhampered by high resolution. This is totally unprocessed, a direct TIF from the scanner. It looks far better on the light table, and it might be possible to extract a far better file from it if I could be bothered, but there’s not much point really. Here are a couple of shots which hint and what might have been possible way back then. 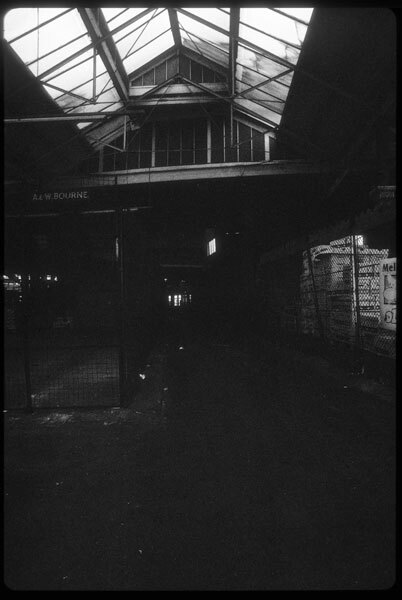 Both direct from the scanner, nothing changed except downsizing to fit. I seem to be permanently attracted by off-beam, marginal and downright eccentric solutions. So I guess I’ll never own a Canon or a Nikon DSLR. Polaroid instant slide film was fun, albeit most of the time totally impractical. At least the monochrome stuff was almost unique, but Polachrome had to compete with 24 hour or under E6 lab processing, and frankly it was never going to stand a chance, except in very particular situtations, such as a when living in a tent in the Antarctic. No, really. Tomas Webb wrote more about Polachrome a while back. The comments on his article are a bit painful: I threw out my apparently worthless Polaroid processor… seems I should have put it on eBay! One of those things I’ve been meaning to get around to for ages, I’ve finally done: revisting my small collection of Polaroid instant slide film photos. Instant slide was probably not one of Polaroid’s better known product lines, but I was a fan until it was discontinued some 10 years ago. I mainly used it during the late 90s, when my photography was beginning to take shape. 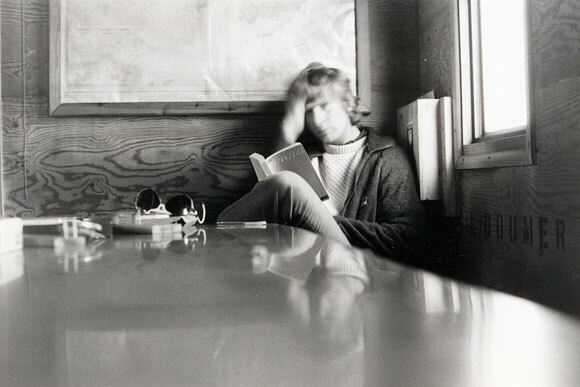 Back then I was strongly influenced both by my then over-riding interest in illustration and narrative as opposed to photography for photography’s sake (which I considered a bit pointless), and by my then girlfriend, an abstract painter who’s artistic education and skill was way out of my league. 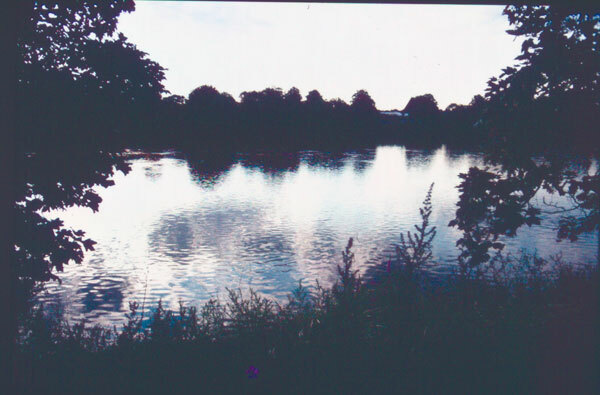 I was also exploring early “cheap” digital cameras as the time, and loved the instant feedback (well, except for the huge Fuji thing I had which didn’t have an LCD), but not so much the quality, or indeed the cost of the batteries. 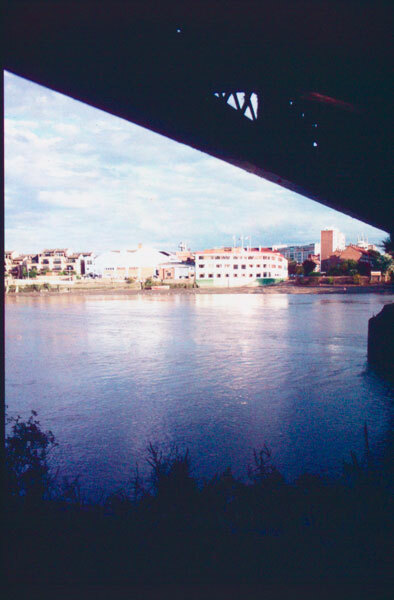 So Polaroid instant slide film, coupled with my pair of Canon A1s, was a great alternative. Polaroid produced several different film types, including Polapan, Polachrome, and seriously contrasty Polagraph. 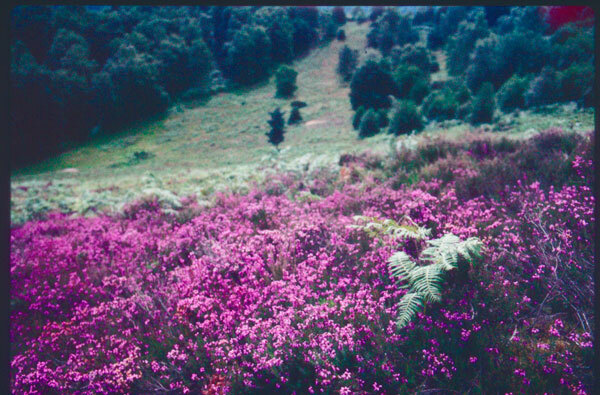 Polapan and Polagraph were, as far as I know, the only positive black & white slide films made other than Agfa Scala. As far as I remember there was also a high saturation colour film designed for graphics, like Powerpoints and stuff like that. Very Old People may remember that there was a big market back in the day for outputting direct from Powerpoint to 35mm transparency. Anyway, digression. 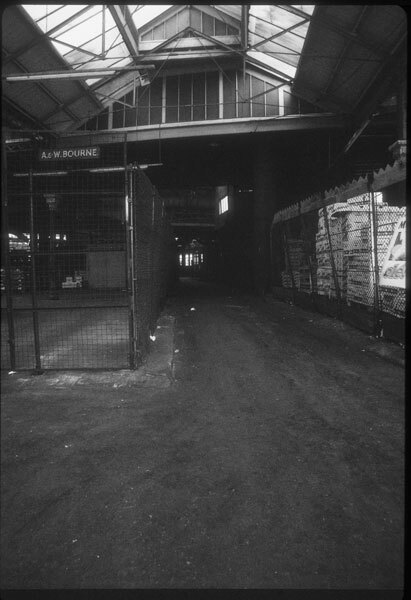 So here, for your entertainment, a couple of shots from a deserted Borough Market, South London, July 1998, shot on Polapan 125, in these examples with a red filter to make it even gloomier. Check back soon for some examples of the actual quite remarkable Polachrome, and the seriously gothic, graveyard-special Polagraph!